This is a fine example of the maxim that less is more. Nothing Means Nothing To You has a deceptively simple backing - no horns just a rhythm section behind an arpeggio guitar - brings Mays' pleading, desperate vocal to the fore. Deep soul is often at it's best in these circumstances where the whole disc is focussed on the vocal. 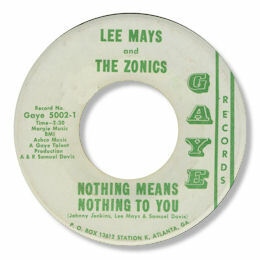 Gaye is one of those small Georgia labels that often have such good 45s on them - in addition to this disc deep fans should also check out Ted Ford, Ernie Wheelwright and Sheppard Brothers on the label as well. Interesting to see Johnny Jenkins, Otis Redding's old employer, as a co-writer here - could he be the sympathetic guitarist? Note ~ "Nothing means nothing to you" can be found on the Black Cats CD "Deep Dip Into Georgia Soul Vol 1". Thanks to Bob McGrath (see Links) for the date.